The easiest way to describe the system I use for organizing my digital photos is to show you how I use this system. This is the workflow that I use every time I take pictures and transfer them to my computer. For each step of my workflow I will be pointing to various articles that explain the details of each step. Read on to see how I organize over 100,000 pictures & videos. The steps in my workflow can be easily remembered by using STORE as the acronym. 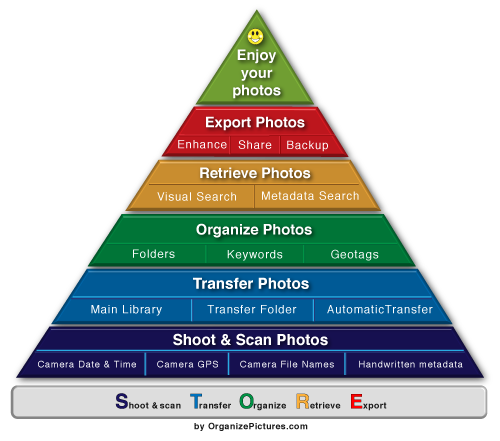 It stands for Shoot & Scan, Transfer, Organize, Retrieve and Export. STORE is a comprehensive, simple and efficient system for organizing your digital photos. This is where it all begins…we love shooting pictures. However, there are three simple things that I check over and over when shooting pictures. These three things will ensure I have the correct information in the pictures I take. Set my time and date on my camera – I am still very surprised by the number of people who do not set their time and date on their cameras. Check your time zone and set your time and date. Make sure you change it when you travel to different time zones and obviously when you get back home. Set your file naming scheme to continuous – Most cameras provide two file naming schemes: continuous numbering and “restart numbering every time I take out the memory card” scheme. You want to choose the continuous scheme. Turn your GPS on for geotags – This depends on your camera model. If you have a GPS in your camera it is useful if you want geotags in your pictures. Be mindful that it eats up your battery pretty quickly when it’s turned on. You can subscribe to my newsletter and receive a free cheat-sheet containing 10 most overlooked steps for organizing your digital photos. In addition, get access to free videos plus get my free tips & tricks delivered to your e-mail. Just enter your name and email below. It’s all free! While I’m not an expert photographer, I have learned a few important tips about taking better pictures. Also, during this step there are some easy things steps for optimizing your camera settings so it would help later in the process. Scanning older photos printed on paper also creates digital photos. This step however, requires me to pay attention to any hand written metadata I find on the back of individual old photos, on the envelopes containing batches of older printed photos or any notes found on the shoeboxes filled with photos. Organizing old photos into batches makes the job of scanning much more precise because after scanning I can organize the scanned photos into their appropriate event folders. I make a mental note of the dates on these batches and sometimes I write them on a sticky note on top of each batch. These may say something like “eighties”. When I scan old photos, I have one simple folder on my computer where all the scanned photos go. Remember that at this step, there are no dates and no camera produced metadata. All the metadata needs to be created by hand, whether it is in the folder names or in the IPTC/XMP fields inside the digital photos. This is the process for transferring my pictures from the camera to my computer or from the scanner to my computer. Even though this step is pretty straight forward there are a few important things that I do to transfer my photos efficiently. While tedious, transferring your pictures is very important to the entire workflow. Long time ago, I started out using the Windows XP Photo Wizard but found out that a few other programs including FastStone Image Viewer offer much more flexibility for transferring your photos to your computer. This step was the motivation behind creating OrganizePictures.com, and as such there is a lot of information on this site that applies here. Once I have transferred my pictures from the camera to my computer I start organizing them. However, before I start dissecting my pictures and move them and tag them, I ask some fundamental questions for each batch of photos. The answers to these questions determine the level of organization I will be applying to them. Once I determine the different purposes I want to achieve with this batch of photos, I start organizing them. This third step in my system is accomplished in three different layers. Each layer adds more and more details about the photos in this batch (metadata in technical terms). I always perform the first Layer and sometimes layers two and three, depending on what I am trying to achieve in the end. Layer 1: Create an efficient folder structure. First I rename the folders according to an efficient naming convention. This way it’s easy for me to find my pictures at a later date. Then I place these folders in a precise folder structure. Now the folder structure is done. Many times I stop here…depending how tired I am. However, the next two steps add a lot more flexibility later in the workflow. Layer 2: Insert efficient image keywords. Once I have created the right folders, I start assigning precise keywords to the pictures I have just transferred. I make sure that I use software that can write these tags to the IPTC/XMP fields attached to each image file. I have been using Picasa to add keywords, but found that XnView is a far superior tool for editing all image metadata fields. Adobe Lightroom is of course a very good tool for managing metadata. Layer 3: Insert geotags. This is closely related to the step above. I separate it because many times I don’t do this step if it doesn’t make sense. For most of the family pictures I don’t need to add geotags. This is the step that really tests my consistency and perseverance with step number 3 (Organize pictures). If I have not been consistent with my folder names and the tags I have created, then this step might end up in frustration. Any decent program will allow searching based on file names and some programs would allow me to search according to the tags I have save in IPTC/XMP. I started out by using the Windows XP search utility which was only searching based on file and folder names. Now, when I’m looking for specific pictures I use Adobe Lightroom or Picasa to search image metadata in addition to folder names. Exporting photos is what makes digital photography so great! We can edit our pictures, share them, email them, print them and make photo books with them. Presenting our memories is so much fun these days. The first four steps are absolutely crucial for this step to actually work. Here are some ways I export my pictures: Edit, Backup, Print, Publish on the Web and E-mail. Do you have a simple and efficient system for organizing your growing collection of digital media? Or do you not know how to find your pictures? Are you frustrated because you constantly change what you are doing on your computer? Having a system that is always the same, always simple and always efficient goes such a long way in allowing you to actually enjoy all the memories you are creating.